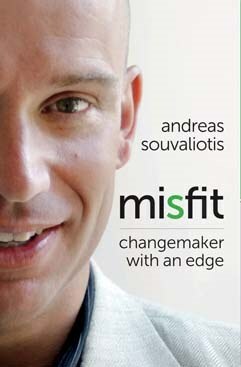 BRANDON, MB – One of Canada’s leading social entrepreneurs and the founder of Green Rewards, the world’s first eco-points program, is returning to his alma mater to talk about his experiences and new book. Andreas Souvaliotis, author of Misfit: Changemaker with an Edge, has been recognized by social responsibility leaders from around the world, including The Prince of Wales, for achievements in influencing and rewarding behaviour change on a mass scale, including creating Air Miles for Social Change, the world’s first social venture built inside a loyalty rewards program. In his new memoir, the self-admitted numbers nerd and weather geek lays out a zigzag journey and subsequent rollercoaster ride that transformed him from a misfit into a change maker. The public and campus community are invited to meet Souvaliotis on Monday, October 7th at 1:30 pm in Room 141, Health Studies Building, Brandon University.